Kuala Lumpur, 21 February 2018 – American pop rock outfit OneRepublic will be returning to Malaysia as part of the Asian leg of their world tour in support of their fourth and latest top-charting album, “Oh My My”! 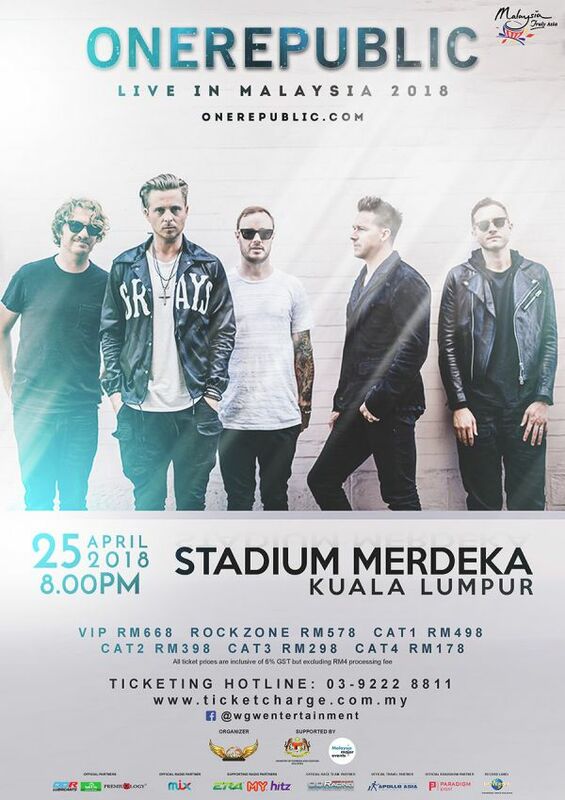 Organised by WGW Entertainment and supported by Malaysia Major Events (MME), a division of Malaysia Convention and Exhibition Bureau (MyCEB), a bureau under the Ministry of Tourism and Culture, OneRepublic Live in Malaysia 2018 is set to illuminate Stadium Merdeka on 25 April. Tickets go on sale 23 February through TicketCharge platforms. OneRepublic Live in Malaysia 2018 is organised by WGW Entertainment and supported by Malaysia Major Events (MME), a division of Malaysia Convention and Exhibition Bureau (MyCEB), a bureau under the Ministry of Tourism and Culture, with ODR LUBRICANTS and PREMIUMLOGY as the Official Partners, MIX as the Official Radio Partner, ERA, MY and HITZ as the Supporting Radio Partners, OD RACING as the Official Race Team Partner, APOLLO ASIA TRAVEL GROUP as the Official Travel Partner, PARADIGM EVENT as the Official Roadshow Partner and UNIVERSAL MUSIC as the Record Label.for all the latest updates on OneRepublic Live in Malaysia 2018, or visit www.onerepublic.com.